In today’s blog, I will walk you through our entire SEO process, our dashboard, our methodologies, and leadership. Many of our partners, who are also marketers like yourself, started with us with limited knowledge in white label SEO. Today, they are all generating revenue and in the profit zone with our SEO services. If you are a marketer and you want to start selling SEO, Social Media and Local SEO products under your own brand, this guide is for you. Once you sign up and become our partner, you will receive a branded dashboard featuring our SEO, Social Media and Local Optimization packages. We also have a la carte services to let you customize marketing solutions based on your niche. These packages are fully hosted and supported by a live 24×7 help desk. You will also have a dedicated account manager to assist with setting up and managing your SEO campaigns, and to help you with online-marketing related concerns. Sign Up here for your dashboard, fill out the step by step form, and claim your dashboard! The dashboard comes with the option to add your logo and select a theme. Customize your dashboard to reflect your brand identity and give your clients your website’s feel. Our dashboard setup wizard lets you add your marked-up price on each package that we offer. When your clients log into your dashboard, our packages will be there with your marked-up prices and they can order services right away. One of the central tenets of SEO is to be transparent about the methods you apply in your SEO practice. Walk your clients through the entire chain of your SEO process and show them how your work influences their business. One of the most preferred and recommended channels is social media. Start by creating a human element on your website using Google+. Of the several ways available, blogging is the most preferred method. Due to the integration of Google+ profiles into search rankings, we believe social media presence is becoming an integral part of increasing your visibility on the web. Not only do you increase your click through rates, you also build readers’ trust, letting them know that you are an industry thought leader. Thought leadership in SEO is about building a tribe and turning it into your advocates. This is done by demonstrating your knowledge of and authority in SEO. The most important means of showing thought leadership is through well-researched content. It can be a blog post, an article, a video or a webinar. Here are some tips that you should try to be considered an expert and a leader in SEO. Build a blog calendar and follow it strictly. You can assign a writer to it and have them follow the schedule so you don’t miss a day without updating your blog. Lightweight interaction starts with microblogging, social media messages and status updates with your subscribers. If you have something great to share that will educate your existing clients and prospects, share it while it is relevant to the industry. Research shows you can turn your subscribers into advocates for your brand by interacting with them through lightweight discussion. Through consistent updates, you can lead them to follow you through your heavyweight content such as reading your articles, downloading your whitepaper and listening to your webinar. Engage with your audience and other industry leaders and share great content. Keep your social media profiles up to date, mainly: Twitter, Google+ and Facebook. Remember that consumers have more power over you because SEO is a discretion-based industry, and they make decisions based on the image you portray. Be as active as you can in your industry. Become the domain expert in SEO. One of the best parts of becoming our reseller is that you don’t need to be the performer, but only the subject matter expert. As long as you understand SEO concepts thoroughly and you can engage in meaningful conversation, you can focus on this while we do the actual optimization on your campaigns. Build both internal and external value network for your SEO. You can do this by providing innovation, customer support and transparency in methodologies to all your clients. All of this defines value network. If you have a great value network in your SEO, your clients are more likely to trust you with their business. 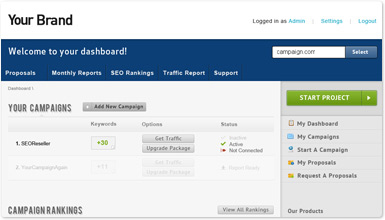 If you are ready to claim your SEO dashboard, build your brand and start selling SEO. Sign up here with SEOReseller.com and become our partner.